← Building with Children ! A few weeks ago, we got an order for a custom table- a lovely, long variation of our “Monster Island” tables. 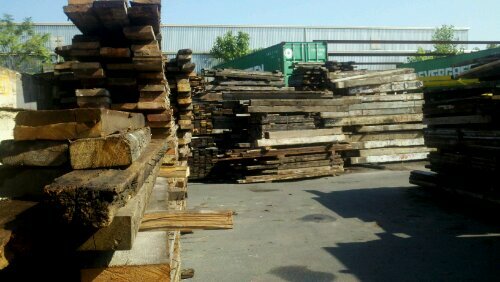 We needed more wood, and I found myself browsing the stacks at M. Fine Lumber in Brooklyn. It is an easy trip from the studio, simply three miles east. I have been several times now, but I am still amazed at the mountains of lumber there. Most of it has been pulled out of old factory buildings in the area. A lot of it is softer, coniferous woods. There is a fair amount of hard oak too. It is easy to find beams that are twenty feet long and more. Most of these trees were felled fifty to one hundred and fifty years ago. Their growth rings are different, and they do not have the uniformity of today’s woods. Sometimes the yard staff pulls the nails out for us. This time, I did most of it myself. A single plank might have fifty nails of varoius sizes. When you see the old nail holes surrounded by an inky black stain, that is the way that the wood reacted to decades of contact with an old nail. These old planks present a lot of challenges, but we love the process!